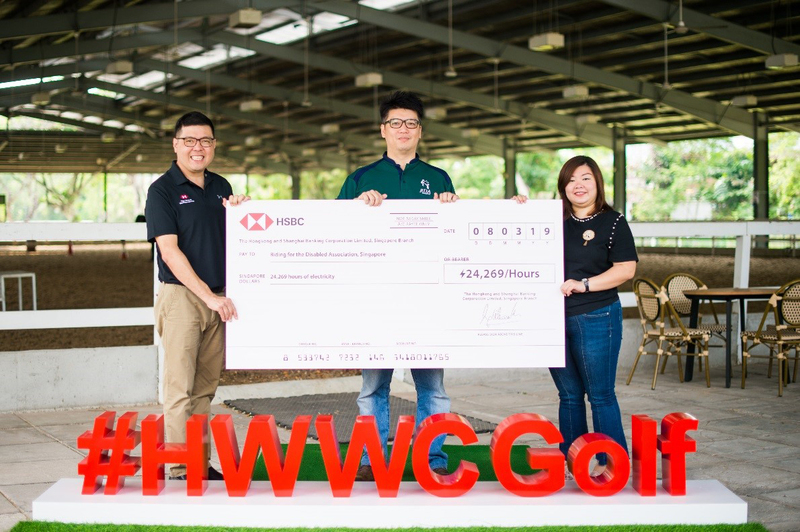 Singapore, 8 March 2019 – HSBC today has donated 24,267 hours of electricity to the Riding for the Disabled Association (RDA) of Singapore, a globally recognised facility which provides equine-assisted therapy (also known as hippotherapy) free of charge to children and adults with physical and mental disabilities. The donation is part of the Swing for Power initiative for this year’s HSBC Women’s World Championship (HWWC), and made in conjunction with International Women’s Day. HSBC will sponsor 24,267 hours of electricity via Geneco, one of the leading retail electricity providers in the nation’s Open Electricity Market (OEM). How powerful is a golf swing? Enough to power the community. Through collective golf swings, HSBC harnessed the power of the public for a good cause – Each golf swing from the HSBC Swing for Power initiative would help provide electricity to support the local community in Singapore. Since 8 February 2019, five Swing for Power roadshows were set up across Singapore’s high human traffic areas - Plaza Singapura, West Mall, Century Square, VivoCity, and Ang Mo Kio Hub. A Swing for Power booth was also made available during the HWWC 2019 at Sentosa Golf Club from 28 February to 3 March 2019. For every golf swing made at the roadshows, interactive bus shelters and through the online game, HSBC contributed 3 hours of electricity to power facilities at RDA. The contribution was made via Geneco, RDA’s electricity provider. A total of 8,089 people participated in the Swing for Power initiative, harnessing 24,267 hours of electricity, which will power the RDA facility for 33 months. With every swing, participants could take a picture of a screen with the number of hours of power they helped to generate. Participants were also given HSBC merchandise as a token of appreciation for their contribution. "We would like to thank HSBC for their generous contribution. The donation will enable us to further our cause, transform the minds, bodies and lives of those with disabilities through equine assisted activities,” said Choy Weng Leong, Executive Director of RDA Singapore. On 26 February 2019, major winner and one of the world’s top 50 female golfers, Pernilla Lindberg of Sweden swapped the golf course for the riding paddock as she visited the RDA as a special guest to observe a daily therapy session to raise awareness for HSBC’s Swing for Power initiative. Lindberg, the reigning ANA Inspiration champion, was given a guided tour of the stables and riding centre and witnessed at first-hand the commendable work being delivered by the association each and every day.